Sorry I've been MIA ladies. Life gets very crazy sometimes, plus I am now attempting (& failing miserably, UGH) to get over a sneezy cold. 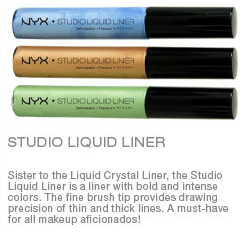 Anyhoo, I just wanted show you guys something that NYX will be releasing soon. Doesn't this look cool? That top liner looks like bottled sky, clouds & all.